Internal Fine Gael tensions sparked by the leadership contest were reignited at the party's annual think-in during an after-dinner speech by Taoiseach Leo Varadkar. 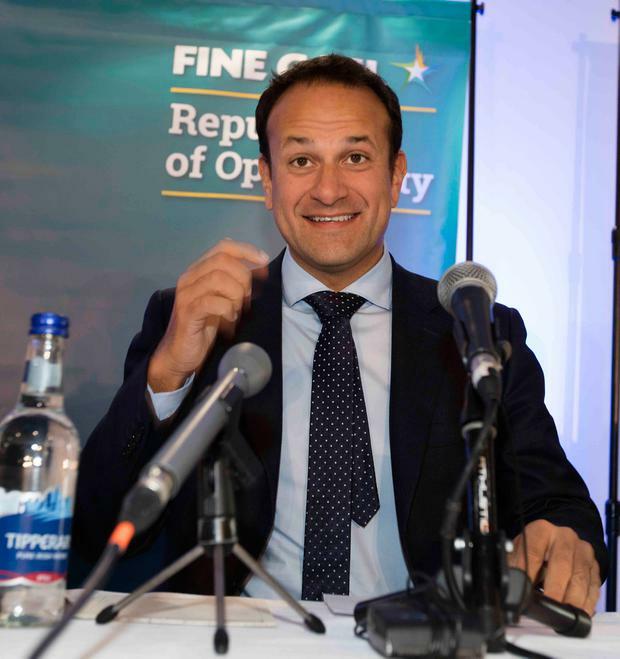 Mr Varadkar poked fun at his former leadership rival Foreign Affairs Minister Simon Coveney who was noticeably unimpressed by the comments made in front of the media and the Fine Gael parliamentary party. Mr Varadkar also joked that former Taoiseach Enda Kenny's Ard Fheis speeches had been "iffy" and made fun of Mr Coveney's supporters. After the meal, Mr Coveney is understood to have told colleagues he did not think Mr Varadkar's jokes about Mr Kenny were appropriate. The minister's views were shared by other TDs who said they felt comments about the former Taoiseach and the current Fine Gael deputy leader were "disrespectful". "I felt the speech was really inappropriate," one TD said. "There was no need to have a go at Kenny when he wasn't there," another party member said. Sources close to the Taoiseach insisted that all his comments were intended to be "good natured" and not meant to offend anyone. At the event in Clonmel, Tipperary, Mr Varadkar delivered an American-style 'roast' speech similar to those used by US presidents to make fun of Washington correspondents. The Taoiseach told the audience that he had contacted Mr Kenny to ask him for advice on making his first after-dinner speech at a Fine Gael think-in. "I said you've done about 15 now of these after-dinner speeches and you do them very well. Ard Fheis speeches were a bit iffy (but) I didn't say that," Mr Varadkar said. He also joked that he couldn't have a drink before making the speech thanks to "Dr Brian Cowen" and Mr Coveney. In 2010 Mr Coveney controversially said Mr Cowen "sounded half way between drunk or hungover" while being interviewed on RTE Radio One's Morning Ireland after a Fianna Fail think-in. Mr Varadkar also joked that "so many people from the Rebel County" voted for him in the leadership election because Cork had never won an All Ireland under a Cork Taoiseach. "I didn't find it as funny as other people found it. I though it was a big cringey," a source said. "Coveney is the deputy leader of the party and some of the comments were verging on disrespectful." Mr Varadkar also poked fun at Dublin Bay South TD Kate O'Connell who branded his supporters "choirboys" looking for jobs during the leadership election campaign. Mr Coveney was seated at a table consisting mostly of his supporters in the Fine Gael leadership contest. Also at the table were Ms O'Connell, Maria Bailey, Hildegarde Naughton and Marcella Corcoran-Kennedy. The Foreign Affairs Minister was clearly uncomfortable being the focus of Mr Varadkar's ribbing throughout the after-dinner speech. However, one Fine Gael source was mostly concerned about the comments made about Mr Kenny who did not attend the event. Former finance minister Michael Noonan, a one-time deputy leader of the party, also did not attend the event. Earlier in the day, Mr Varadkar paid tribute to Mr Kenny in his opening address to the parliamentary party meeting. "I am struck by the fact that this is the first time in 15 years that we are holding a think-in without Enda Kenny as our party leader," he said. "So many tributes have been paid to him over the past few months - and deservedly so. "But today I will again repeat what I have said many times before, as a country and a party, he gave us back our future." It was Mr Varadkar's first Fine Gael think-in since becoming party leader.